We’re two weeks in and feeling pretty settled to life on the trail now. I’m sure it’ll change as we head north, but for now everything seems to be going encouragingly well (although that’s probably now jinxed it). As such, we thought it was time to shed a bit more light on the experience for family and friends back home, before we inevitably do something stupid along the way! Robin passing a white blaze on a rocky section in North Carolina. Navigation on the trail is easy. The AT is a path well trod and there are white blazes (6×2 inch vertical stripes) on trees every few hundred feet or so. Paths to water sources and shelters are marked with blue blazes. There’s been a troubling lack of signage to escalators and ski lifts, though. Shelters crop up around every eight miles and are essentially wooden cubes missing one side and with a platform for sleeping on. Shelters guarantee two things: mice and snoring. The second is way worse than the first! The mice live in the shelter and feed on the crumbs and detritus left behind by hikers. Whether staying in a shelter or camping, you’ll be hanging a bear bag, so you shouldn’t have any food in your pack, but if you’ve missed anything, or have any crumbs in there, the mice will find them. They also have a liking for paper-like materials for bedding, so best to keep them out of there too. We’ve learned it’s best to leave all the pouches and zips on your pack open over night. That way the mice can investigate any smells without chewing through your pack, which they will do if it’s their only way in. Squid Kid, Hedwig, and Robin relaxing in the shelter after a long day. You’ll hear them scurry around you at night; twice I’ve felt them scurry over top of me. Robin, being a deep sleeper, has managed to avoid this to date, but I don’t give it long. Hanging bear bags is really important. If a bear in the area smells food and comes looking you don’t want it coming to your tent, so you hang your food and toiletries in a dry bag up a tree, away from where you’re sleeping. You want it ten to 12 feet off the floor and far enough from the trunk so the bear can’t climb the tree and reach the bag. If you ever want a laugh, come watch us put ours up. Comedy guaranteed every time! On the trail water is really easy to come by. We pass multiple water sources each day and carry a water filter to clean it. We have a 2L bladder to fill with dirty water which then passes through our filter and gives us 2L of clean drinking water in 90 seconds. 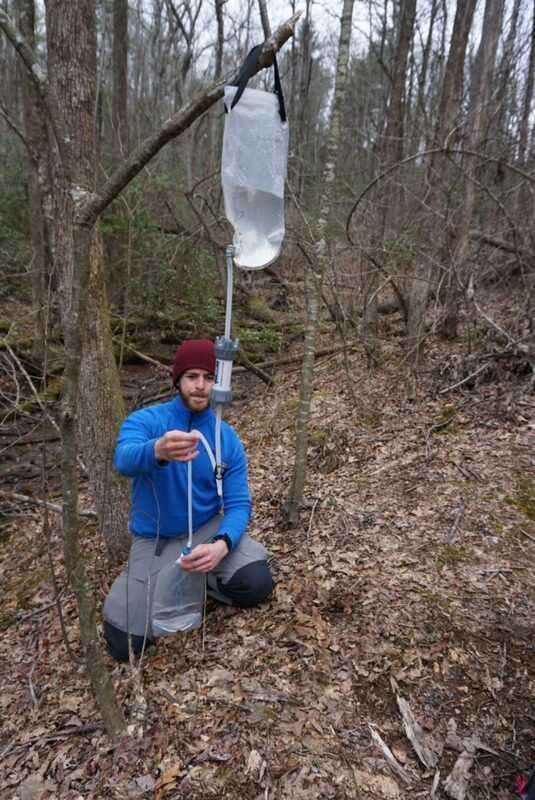 If the filter freezes it becomes permanently useless and you don’t know until you get sick, so we sleep with it in the sleeping bag to mitigate the risk. Buck doing his best concentration face while filtering the water for the day. Food is fairly consistent and unimaginative. We tend to share an instant rice and pasta side and an instant mash potato sachet. It does the job. Breakfast is always instant oats and we tend to make chicken and cheese wraps for lunch. We usually carry four or five days worth of food out from each resupply in town and are expecting our first Michelin star any day now! All that food has to go somewhere and ultimately it’s into the ground. If you’re at a shelter there’s often a privy, which is basically a long-drop toilet. Do not look down the hole. Just don’t. If you’re out on the ground you need to dig a cathole, do your business in that circa six-inch hole, cover it over with earth and then use nine liters of hand sanitizer. OK, make it ten. The generosity of spirit surrounding the trail is almost overwhelming. It’s honestly amazing the lengths some people go to to help us on our way, and that’s called trail magic. 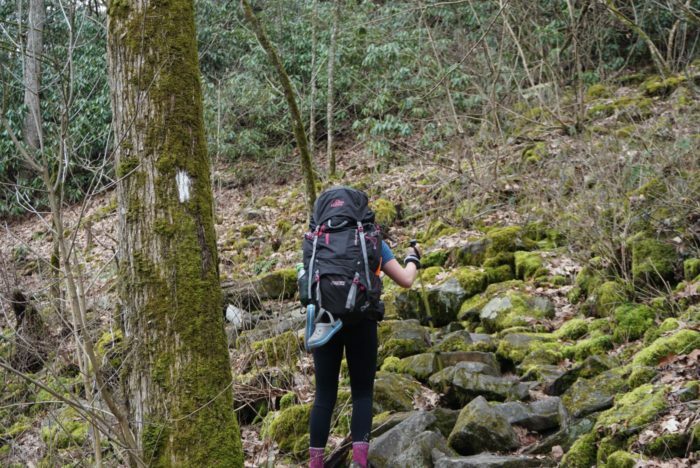 It’s often previous thru-hikers, but there’s also lots of folk from local towns who do it too. We’ve crossed roads to find boxes of doughnuts left on the other side for hikers. We’ve been halfway through a freezing cold and wet day to find someone serving hot chocolate from the back of their van. The 24 hours in Franklin were full of it. We hiked to Winding Stair Gap where we planned to hitch a ride into Franklin for a resupply. As we were getting near to the road we found a cooler in the woods full of cold soda and beer. It’s an instant morale boost! We got down to the road and there two previous hikers stood by the boot of their car, handing out drinks, fruit, chocolate, and other treats. As much as we want to carry is ours. We mention we were planning to hitch into Franklin and they pack up their stuff and drive us the ten miles into town. First they take us to the outfitter (we need more para cord and Squid Kid needs new shoes), then they take us to the supermarket to resupply, and after that they drive us to our hotel. These people have given us food, drink, and a free shuttle ride, for absolutely nothing. The next morning the trail magic continues. At 7:15 a.m. a minibus from the local Baptist church pulls into the hotel car park and takes us for an all-you-can-eat pancake and bacon breakfast. They literally won’t stop feeding us, they couldn’t give us enough, and they do this every day through March and April. After that they take us back to the hotel and we get a free ride from a local back to the trail. Around lunchtime we’re hiking along and we come across My Friend, another previous thru-hiker. He’s set up a whole picnic area and has just started cooking hot dogs on a camping stove. Alongside that he’s got soda, doughnuts, chocolate, and more. Again, there’s no limit to his generosity and I end up eating four hot dogs. In town yesterday we stopped in a restaurant to get some quarters for the laundry. The server shows us a stack of receipts from dinners the locals have had in there over the last few days. They’re all receipts where the locals have intentionally overpaid, so that overpayment can be passed on as a discount to hikers passing through. 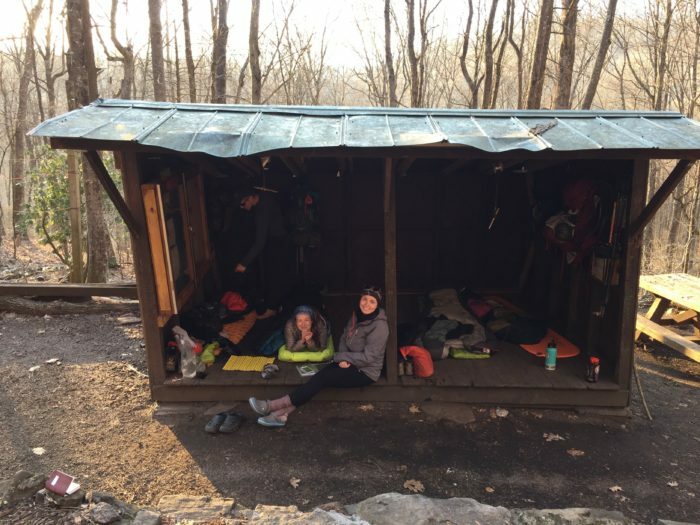 We are immensely grateful for the kindness shown to us from those around the AT. It’s not just a free meal, or the chance to stretch our supplies and money a bit further, it’s a genuine support network of people rooting for you to succeed. It’s also something we should never take for granted, come to expect, or feel entitled to. We chose to do this; it’s on us. Although living in the wilds really isn’t that hard when you’re doing it with a hot dog and a cold Dr. Pepper on a beautiful sunny day. We’re posting this from a cozy wee spot in Fontana; next post about the previous few days to come shortly. I’ve been following your journey from the comfort of home here in the UK and am so envious of you. I’ve had a fascination with the AT since reading A Walk in the Woods way back in 1998 and have a bookcase full of similar thru-hiker books. The closest I’ve come to the AT was 18 months ago doing small sections of it on day hikes on Mount Greylock, MA. and from Pinkham Notch, NH. The itch is always there though I’m just not sure if I’m brave enough to give up everything and scratch it. Until I am though I’ll continue to do it vicariously through people like you who are brave enough! I love reading the stories and reviews! Keep em coming, and keep on trucking! hi guys, I love hearing your stores about trail magic – we should have more of this in day to day life I think.